Of course, most Airstreams are pretty cool both inside and out, but a definite problem is brewing. Today, when most Airstream trailer interiors look alike, we are bending the rules. Being the passionate guy that I am, I couldn’t stand silent knowing there are many exciting new and different solutions to life that have not been explored. Boy, did I ever discover a “head turner” and possibly a home run “see photos”. Not only does the “over the top” silk interior look gorgeous with warmth, uniqueness, and “lure’, but what an internal business attraction for jewelry, clothing, and accessories for all ages. 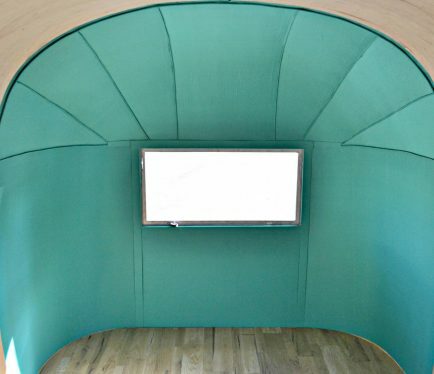 Our inner walls, ceiling and windows have an imported polished SILK (in any color) which most definitely will stop any shopper and also create a very exciting buzz around the exterior of the Airstream. I call it an Airstream on steroids. The few people that have seen the newly created interiors are coming up with a number of unique interior themes. Please use your imagination to apply your multi-colored interior fabrics to your show stopper internal showroom. I guarantee most will love the look!! !